The "designed for 6 quarts, Marketing said 5" ... has so often been repeated that it is now considered as fact in the AMC community. If the design requirement was for 5 quarts to be competitive with other OEMs, why Engineering would ignore that requirement and design it for 6 makes little sense to me. It makes more sense that adverse use / fleet applications uncovered a weakness in getting oil back to the sump quickly or controlling slosh where adding an extra quart was a band-aide solution for those applications at little extra cost. If someone cam post an AMC technical document stating the pan was designed for 6 quart capacity and Marketing said 5, please do so to clarify the myth as fact. TSM and owners manuals state 5 quarts with filter change, but I understand adding an extra quart over stock specs helps in some applications. 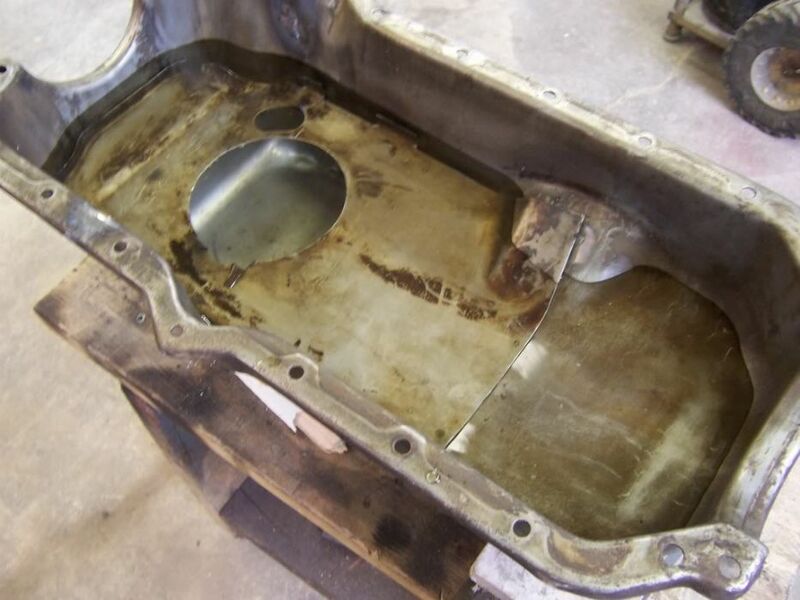 To me, a better idea is to fit a proper high capacity pan to suit your application - deep sump for drag and wide sump with trap doors and baffles for road-race. Several manufacturers offer pans - Canton, Milodon, Armando, Aviaid. Why band-aide the stock design with an extra quart when you can fit a better after market option? I don't think anyone would be foolish in using the pan for endurance or heavy 8000+ RPM as is. If any thing, the engineers at AMC made their best effort for police environment use. So, adding 1 quart max with that pan should be just fine for track day and street usage. Basically I have done well with my stock 304 engine and standard pan. Believe me I ran that engine hard above 4500k rpm a lot for years on end, and never spun a bearing, but did drop a valve under a blip to decelerate on downshift, which was fixed by head replacement from the wrecking yard. Kept running hard years after until sold. I just don't see running the big money aftermarket pans when a car is not built for competition, just for a fun driver. IMO, the pan should do very well for most track day / daily drover cars, and should not be discounted because many who do race mostly with their cars are trying to compare with, when there is noticeably differences as to warrant use for bigger and better pans. For my build nobody makes a pan proper for fit and clearness, so I have no choice in using my own custom design. Though I would not cut up the aforementioned pan, as it is very unique and can be used for non race builds. Just wanted to share some photos of an interesting variation (side drain plug) on the factory solution for any spirited driving encountered by a car equipped with the AMC police package. This was what the factory deemed adequate for such driving. Are there better aftermarket options? Well, of course - just like there are headers to replace cast iron exhaust manifolds, Holley carbs or EFI to replace a Carter AFB, an Edelbrock aluminum intake to replace a cast iron manifold, etc. But, all of those factory parts do the job. This is what the factory provided as part of a package and I doubt any police departments changed out the factory oil pan to an aftermarket Milodon, Aviaid, etc. upon receipt of a brand new vehicle. Using that pan, I can see why the spec was 6qt so there is always enough oil to get over the walls. The 'walls' of the baffle are approx. 3" in height, HOWEVER, the oil doesn't need to get over them - the baffle 'leaks' through to the drain plug. I tried it by filling the pan with water and then removing the drain plug, just to confirm that any oil in the baffle would drain out. 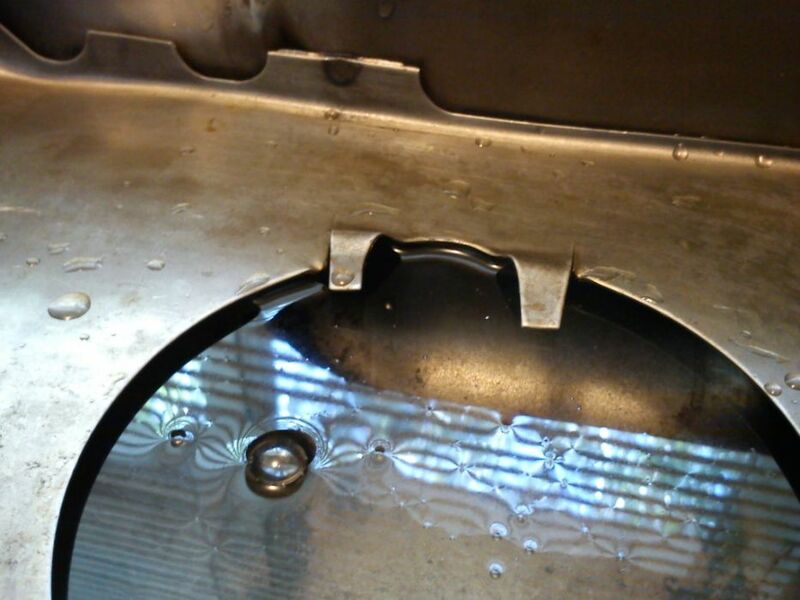 There are 5 factory spot welds placed in an arc around the oval cutout of the baffle attaching it to the oil pan - the 'T' shaped cutout has a 'bump' in it creating a channel between the baffle and the pan to allow it to both drain and fill up. It's hard to see in the photos but it's located at the bottom RH corner of the 'T' cutout of the second photo. I figured there was some amount of oil that could get in and out of the bottom of the baffle, it just didn't look very significant in the pictures. What I mean is, the oil system can flow a lot of GPM and it doesn't look like the baffle system bottom is going to flow in enough oil, it seems to me that it is going to require oil to come over the walls to keep up. This is total speculation on my part: Lets say that at a constant running state on a highway at 2,500 rpm, the oil system may be trying to flow several GPM. I'm guessing this because I seem to remember 10 GPM capacity cropping up occasionally when talking about the v8 oil system. This amount seems reasonable compared to other oil systems that I've worked with in the past. Also, many oil filters for the v8 are rated for 9 - 11 GPM. Looks to me that just a little bit of revving will quickly empty that baffle box, there is going to need to be enough oil resident in the pan to get over the walls and keep a supply, it makes sense to me why AMC spec'd an extra qt with applications that had this pan. By all means, take what I say with a grain of salt. It is my opinion and I have little documentation to back it up. Ya, thanks again for posting them. It is enlightening to get a peek into some application specific AMC engineering. Do you know if the pickup had any differences with this pan? -Yes, the stock pan does have a small-ish capacity for what it does. The issue really is that at 5 quarts, you lose 1.5+ quarts in all the passages, filter and lifters, leaving you 3.5 quarts in the pan. If you run it at 3500+ for a while, you can easily have another 1.5-2.0 quarts in the valve covers, leaving you with 1.5-2.0 in the pan, maybe less. Probably ok on an Ambassador driven conservatively, but do a sharp corner in your AMX with the oil at that level and see what happens. Now, if you consider what this all looks like if you are just above the "add" mark on the dipstick and you can see the issue. You could be running with little more than 1/2 a quart in the pan! -6 quarts actually is above the windage tray in a stock pan, when not running, but as soon as you start it and the passages all fill, it is below the tray. I have run my car with 6 quarts for years. I did not tend to have an issue, but it did happen now and again that after a long highway run I would get the idiot light if I even braked quickly. I think that the 6 quarts is the cheapest insurance that you will likely ever find for your bottom end, at least in most street driven/restored vehicles. Competition is another matter. PS: these photos might be useful. Stock pan, top one with 4 quarts in it, bottom picture has 6. The 4 quarts picture should approximate what the pan is like when running with a total of 6 quarts of oil. Just about even with the windage tray. I treat the "full" mark on the dipstick as the "add" mark and do just fine! PPS: Also consider that when the oil is lower and only in the deeper part of the pan, being a quart low will make a bigger difference in oil depth than when it is spread out over the full length and width. Just an extra thought, I have wondered why I have never seen anyone do outside return lines? It is mentioned in PAS and I would think that for a street driven GT style car, that would work well. If you could avoid the oil retention in the valve covers issue and perhaps put a home made baffle system around the pick up, that should be sufficient for a street driven vehicle I would think. 6 quarts in a stock pan should do it, with those mods. Full boogie competition machines are different of course. Great show and tell. 6 qt makes a big difference it seems. Thanks! Those pics were posted by someone else on this forum a few years back, so whoever he is, kudos to him! I agree, they do a great job of showing what the oil level actually looks like in the pan. A picture is worth a thousand words, as they say.